I woke this morning with a slight head on me. I had had a very surreal dream – one of those dreams that you’d swear was almost real. But as I sit here in the quiet of the mountains, with the birds singing outside and Sandy dozing on the window ledge, I know it was just a dream. In the dream, I was at a huge party, and the party was full of bloggers. We all know that bloggers don’t exist. They are just names and text that appear on computer screens, but they’re not real people. But in this dream, they had all come to life. All the people at the party were crazy, and they had all named themselves after bloggers. There was even one very beautiful person who came up to me and whispered in my ear "I don’t exist", and then she vanished! It’s amazing what weirdness the brain can toss up. In the dream, everyone was extremely friendly [which is another reason I know it was a dream]. There was music too, and George Bush [Dubya himself] was there. There was lots of handshaking and kissing and people calling out my name. I think there was a part in it where I made a short speech into a microphone. There was another part where I got undressed and I had my photograph taken. In another part of the dream I had to strangle someone and be photographed in the act. Was it a snuff-dream? I hate waking up from dreams like that, because they are fun, and this was one of the best I have had since myself and Sharon Ní Bheoláin were stranded on an island. I found the cause of the dream. 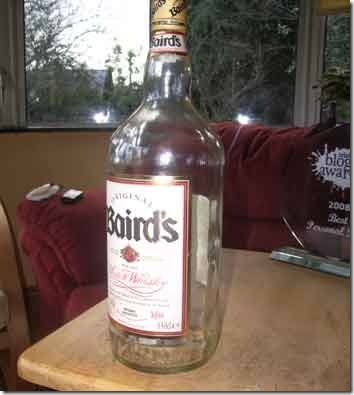 There, on the kitchen table was an empty 1.5 litre whiskey bottle. I suppose one and a half litres of whiskey would induce some kind of reaction? I must cut back on my nightcaps. But beside it was a strange and lovely piece of glass, that has "Irish Blog Awards, 2008 Best Personal Blog" written on it. I don’t know where it came from. I know it has to somehow be part of the dream, because I could never actually win one of those, no matter how much I wanted to. It is the unattainable and ultimate accolade. I’m going to sit and watch it all day. I know it will fade slowly and eventually disappear. The glass will go first, and the last thing I will see will be just the lettering, before that too disappears. Like the grin on the Cheshire Cat. I hope there is video and photos to help you remember when the fog lifts. Stay away from Grannymar’s joint. Congratulations! You and Grannymar are a great pair. May you both keep blogging for years and years! Congratulations! I was checking all day to find out. The awards site is a little slow on the news. And this, sir, is why we love what you write so much. And the award for best Blog Awards Post goes to….. I asked Grannymar what she would spend the prize money on and she said you had made off with it! Now I know what you spent it on – and in the middle of Lent! Isn’t that typical…. The one day I want to connect to the Interweb, my connection goes belly-up. They disconnected me for a few hours, and I had some very confusing conversations with my provider who a) tried to convince me I was my own brother and b) that I lived in Sallynoggin [where Dustin the Turkey comes from]. Anyway, I’m back. Thank you all. I’m still a bit numb, but that could be from fighting with that bloke on the phone. It was a fantastic night [I think?] and I just wish it could have gone on a while longer. Like, for a week or two? Many congrats Grandad on the win along with Grannymar, gave you guys a mention this morning on the radio cause both your speeches really stuck in my head. Great to meet you and granny last night. Well done n all that…….. Cheers Grandad. You brighten our days. McAWilliams – On the radio? Wow! I can’t even remember what I said…. Thanks! Manuel – It was great meeting you too. I can put a face on you now!! TT – Thanks! I brighten your days like a nuclear explosion, with lots of fallout? What a night!! I didn’t enter my blog this year. I would have had an unfair advantage, being so brilliant and everything. Congratulations Grandad on the award, but don’t expect me to dust it. Fair balls. Many congrats good sir. Woo-Hoo! We love ya waaaaaay over here in California too Grandad! Please come pick up a little token of my affection (not affliction) when you get the chance! Congrats!!!!! Thanks, everyone. When the head clears a bit, I will try and elaborate tomorrow. The money is gone. I spent it all. Stop going on about it. Will someone tell me what I said, because I have seen a couple of comments on my speech. Was it rude? Did I swear? The dance would have been better if Grannymar had been in step. One last point, Marlys – Don’t pair me off with Grannymar. It will give her Toyboy ideas, and Granny would be furious!!! Well done again, Grandad. Much deserved. It was a pleasure to meet you last night, and a double pleasure to see that some of us at least still are smoking in Dublin bars! Congratulations Grandad!!! Your blog brings immense reading pleasure m’dear. Aw! Thanks, Jayne. Sure, where would I be without my readers?